Smaller groups, tighter focus, greater growth. Each semester I look forward to sectionals. They are a chance for Allison to work with us on the trickier sections, and a chance for all of us to tackle those parts we don’t quite get. This time we are challenged by multiple languages, whether in “Vedi! Le Fosche” or “Jai Ho,” “Circle of Life” or “Habanera.” The divisi of SAA or SSA has been ironed out (I think). Pronunciations and emphasis are given extra attention (think of Allison saying ‘syl-lab-ble’). Occasionally, a surprising direction (or per mission) is given, especially when reaching for those highest notes! 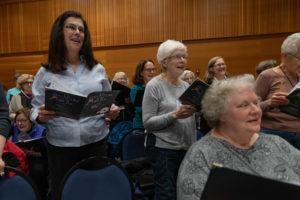 We also get to spend time with just our section, visiting beforehand or standing beside someone different while singing. I always feel this extra rehearsal really produces change in leaps and bounds for our musicality. We begin making music, rather than just singing notes. Sectional rehearsals also signals a time shift in our semester. We are about half way through! That is so hard to believe! We have come so far from the shock of the first night when we were given so many different pieces to learn. Now, we know we can do this. Like all of you, I look forward to every Thursday. I can’t wait to see how far we go this spring!